Jesus has already redeemed us from the curse that entered into this planet through Adam’s disobedience (Genesis 2:16, 3:16, 17; Gal. 3:13). Deuteronomy 28 gives us a catalog of the blessing for obedience (vs. 1-14), and the rest of the chapter gives us an extensive list of the curse for disobedience (vs. 15-68). This curse is what entered into the earth with Adam’s treason. 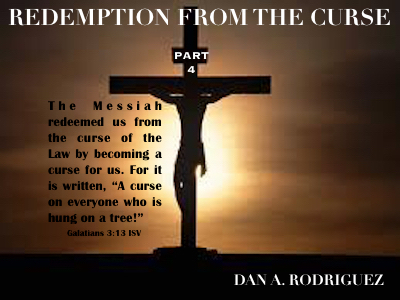 Once we find out what is included in the curse; we begin to understand the breadth and depth of our redemption in Christ. It is awesome! This information is VITAL! It can be the difference between life or death, healing or sickness, abundance or poverty, courage or fear, strength or weakness, and victory or defeat. Listen to all the previous messages on the subject. Don’t miss this striking and life-changing revelation! Be mightily blessed!